As much as I love breakfast foods, most mornings are too rushed to put together a tasty, full meal. And while I like cereal because it is quick and easy, it just doesn’t stick with me for long – my stomach starts growling about an hour after I eat it! Unfortunately, some of the tastiest on-the-go breakfast foods aren’t loaded with the ideal nutritional profile either. Donuts, pastries, muffins – yummy yes, but really more of a treat than a nourishing breakfast! Then there is the sugar-crash that comes after having such a treat. You get a burst of energy right off but a little later, your energy level goes crashing down! The same goes for toast, even whole-wheat toast. It provides healthy carbohydrates and fiber but not much protein. Adding some protein and healthy fat to the carbohydrate in whole grains will help keep your blood sugar stable and avoid the sugar-crash. Also, try and think of breakfast as an opportunity to add some cancer-protective foods such as deep-colored fruits and even vegetables to your diet. Start with 100% whole-wheat toast or another whole grain bread and try one of these toppings to fuel your day! 1. Pesto, bell pepper and mozzarella. For those who like a savory topping, this is almost like pizza for breakfast! 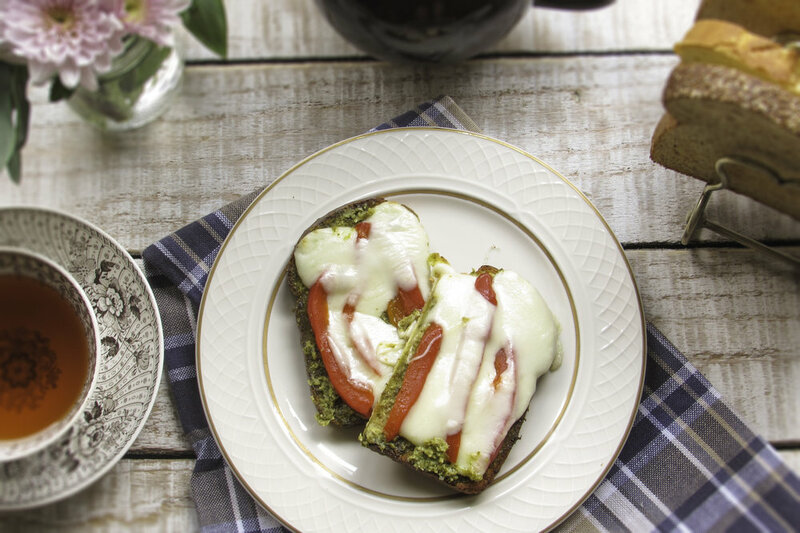 Spread prepared pesto over lightly toasted bread, top with strips of roasted bell pepper and layer mozzarella cheese over the top. Broil until cheese has melted. The cheese provides protein and the bell pepper and pesto are high in antioxidants. 2. Peanut butter, strawberries and lightly toasted coconut. Kind of like an open-face “PB&J”. 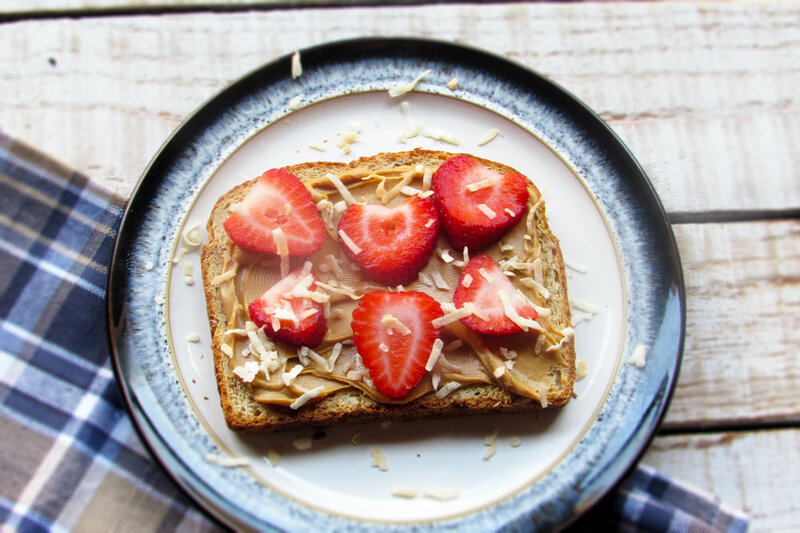 Spread peanut butter over toasted bread and top with strawberries and coconut. Super-simple to make, the peanut butter provides protein and healthy fat while the strawberries deliver vitamins and antioxidants. Try other berries such as blueberries for another antioxidant punch! 3. Cheddar cheese, apple and cinnamon. A step above basic cheese toast. Top lightly toasted bread with a slice of cheddar cheese. Broil until melted, top with thinly sliced apple and sprinkle with cinnamon. I like to broil it again for just a minute to warm the apple. 4. Goat cheese, pineapple and almonds. One of my favorites! 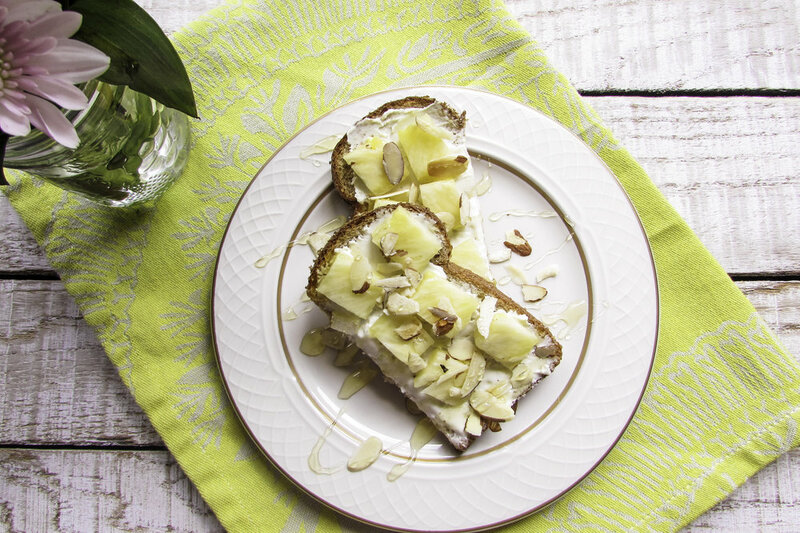 Spread creamy goat cheese over toasted bread, top with chopped pineapple, sprinkle toasted almonds over the top and drizzle with honey (if desired). Creamy goat cheese has a slightly tangy taste that is complemented by the tart pineapple. Don’t like goat cheese? Try ricotta cheese or even cream cheese instead. 5. Guacamole and hard-boiled egg. Definitely my favorite! 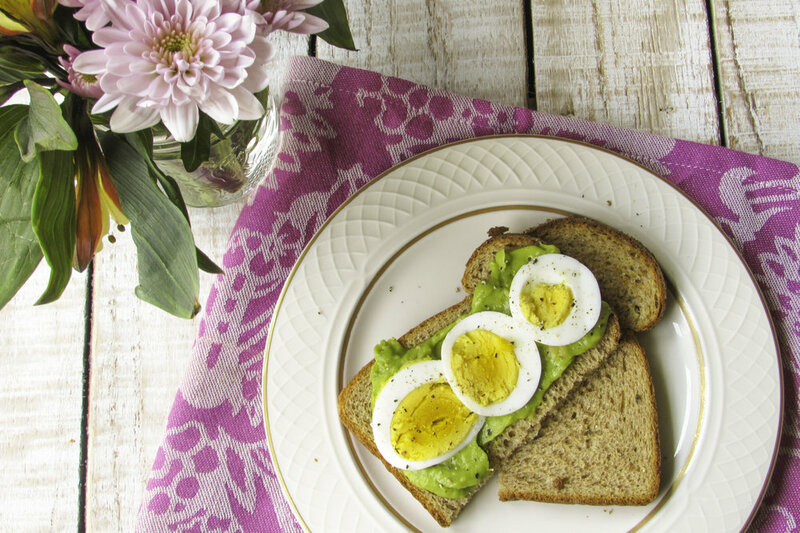 Spread prepared guacamole over toasted bread, top with slices of hard-boiled egg and sprinkle with pepper. I like avocado toast as much as the next person, but let’s face it – avocado is expensive (and I’m not the best at judging when it is ripe)! Prepared guacamole is ready to go, keeps for several days (covered) in the refrigerator once opened and I can usually find one brand on sale any given week. I’ll boil several eggs the night before and keep them in the refrigerator overnight so this topping comes together in minutes. Guacamole is high in healthy fat while the eggs provide a complete protein. This toast topping is so delicious and nutritionally balanced to boot! Anyone have other ideas for quick, easy and nourishing toast toppings? ?